Austerity has “gone too far” and is weakening the “availability and quality” of social care services, the Association of Directors of Adult Social Services (ADASS) has warned. 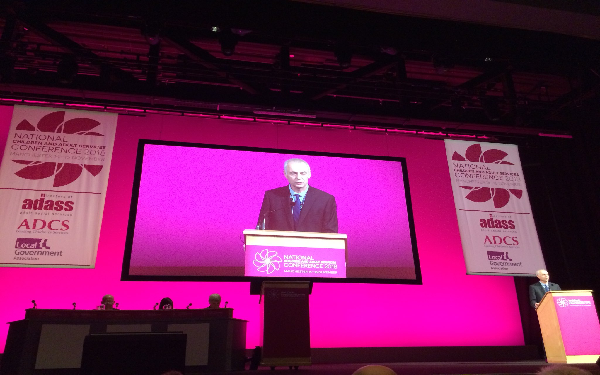 Speaking at the National Children and Adults Services Conference (NCASC) in Manchester, ADASS president Glen Garrod said cuts to social care funding had led to a decline in services and a reduction in standards, despite a show of “remarkable resilience” from care providers. Garrod emphasised the social care market was looking “increasingly fragile” and insisted some areas of the country had already “reached their tipping point”. “Both big and small-scale providers are clearly distressed and whilst many continue to survive, how many are thriving – too few. This is not a buoyant market,” Garrod said. The consequences of this deterioration on individuals and their families was not yet “sufficiently well understood”, according to Garrod, who said in excess of 1.4 million people were struggling without help from councils. Asking delegates to “challenge the shortfalls in the system”, he made reference to the upcoming green paper on adult social care as a crucial catalyst for change: “We have a watershed moment, a chance to change the legacy that has been left to us with a better one,” he said. Garrod continued to say attention given to delayed transfers of care in previous months had “come at the expense” of better support in the community, which he said had resulted in more people entering and remaining “unnecessarily” in residential care. He reminded delegates that a “collective endeavour” from all the departments, including health and housing, would be needed to improve care, emphasising special focus on one area “should not be at the expense” of another. On the subject of each department receiving equal attention from the government, Garrod said social care continued to remain “too much of an enigma” to the public, with efforts of the 1.5 million social care workforces going “unheard and poorly rewarded”. “Our ability to connect people with communities – to act as community connectors is not given sufficient prominence in such a limited role. Our credibility, our contribution to social justice, our story is increasingly being seen through the prism of the NHS. The ‘local authority’ say they have no money for those who need help if they do not meet their criteria for such help . Regardless of what the law says and states in the many legislative and legal acts set out to protect those who are in need of assistance from the government, but help and services that are clearly outlined in “The Care Act” and eligibility criteria , is NOT followed. Causing individuals to suffer inhumanely conditions and further more making the individuals health issues worse, effecting their mental health and their wellbeing and others around them including family members,friends and dependants. Yes it’s all well and good having it on paper but in reality this means nothing. Compulsory private insurance. The only long-term solution to social care funding.